I’ve arrived at My Son Sanctuary about a half hour ahead of the legions of tour buses that will soon lumber in to fill the large parking lot at the entrance. 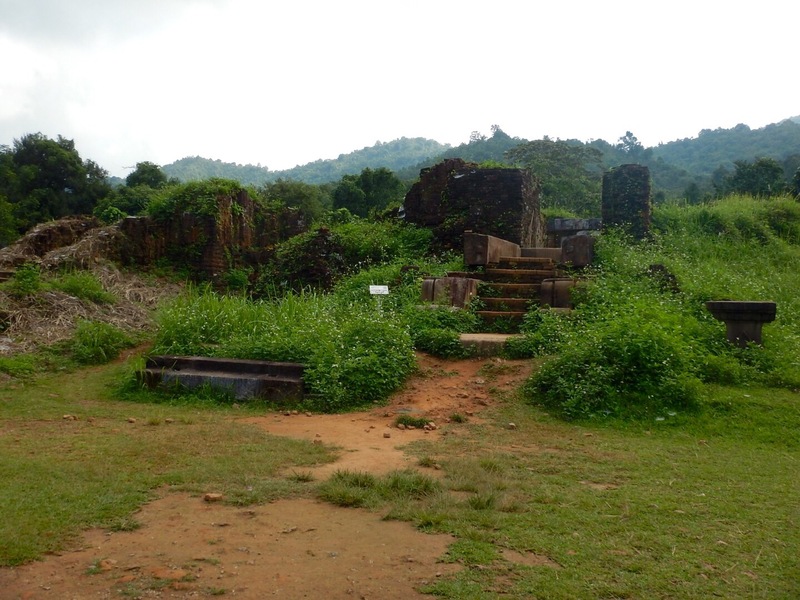 The term sanctuary is completely appropriate for this large tract of mossy, red brick monuments tucked into the foothills of the Marble Mountains. 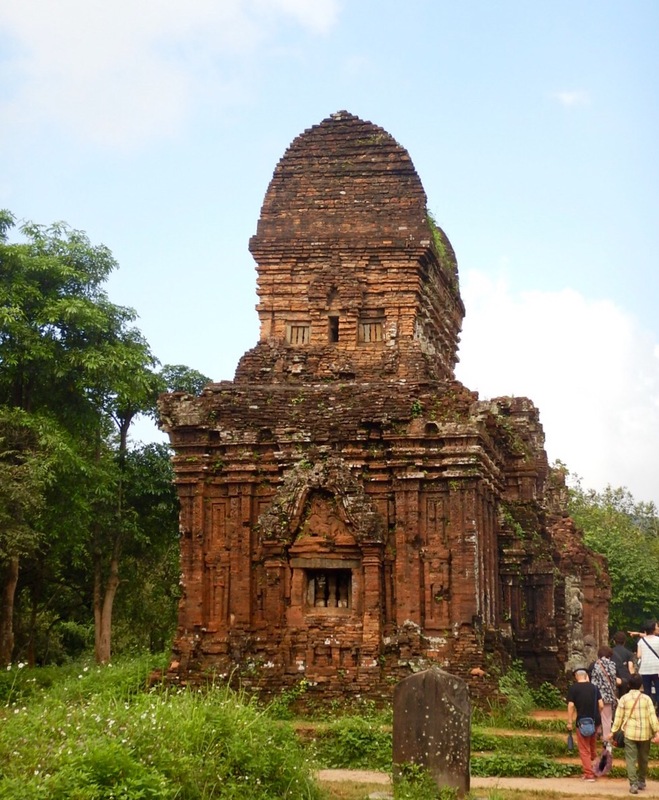 My Son Sanctuary (pronounced mee sun) was built over almost ten centuries between 400 and 1300 AD. 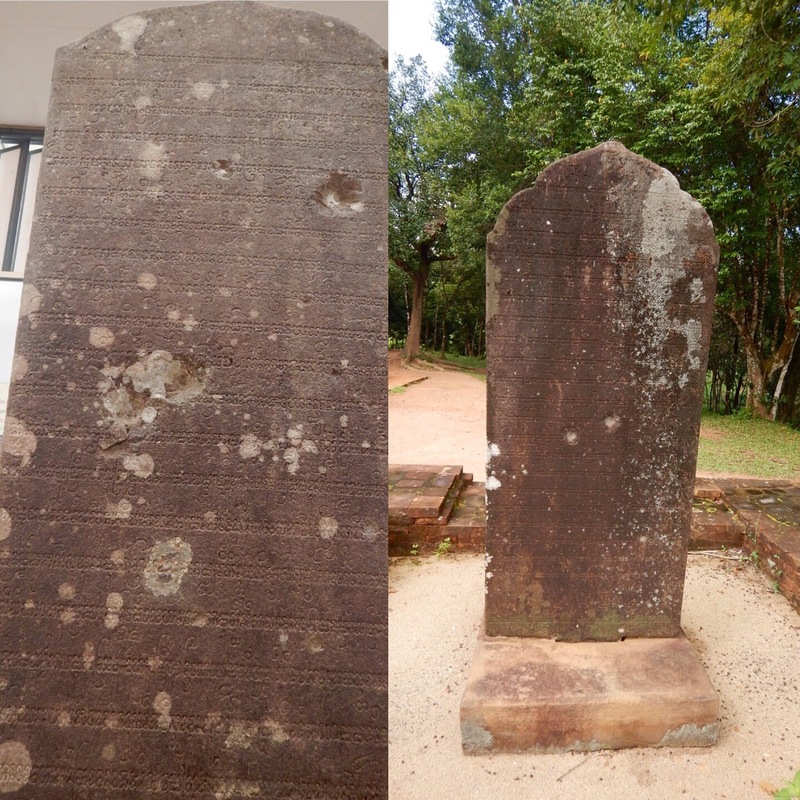 It was the cultural, spiritual and political center of the Champa Kingdom – a people known as the Cham, a sect of Hinduism. 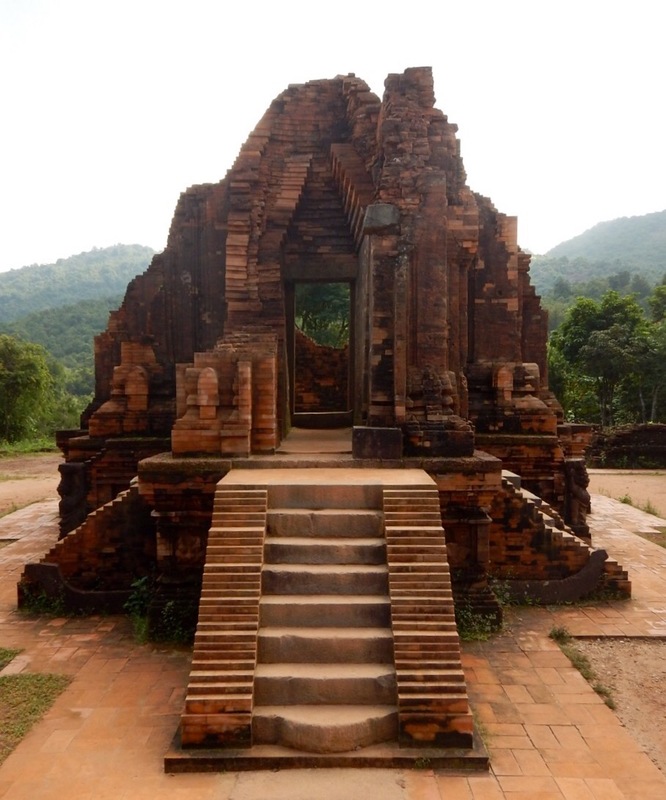 By the 14th century the Cham were persecuted for their religious beliefs and eventually driven out of Viet Nam and other southeast Asian countries. 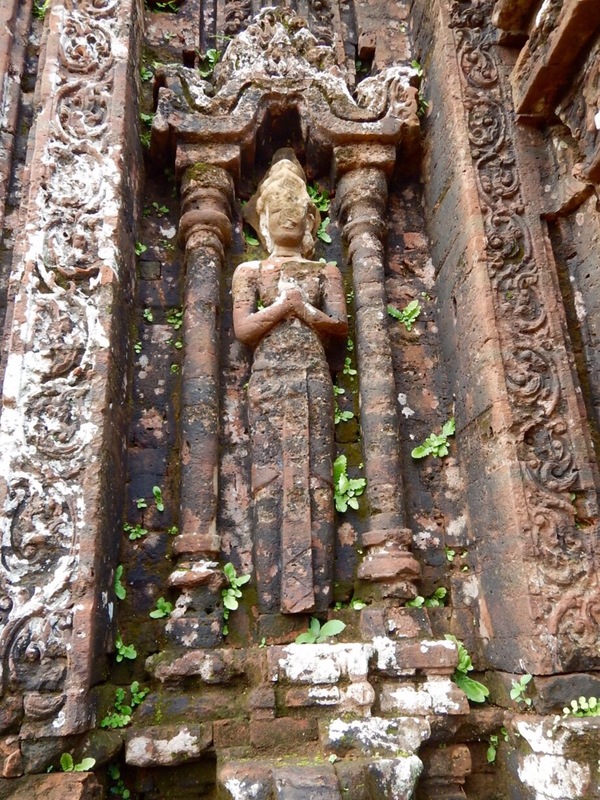 Small enclaves of Cham still exist in Viet Nam and Cambodia, keeping mostly to themselves and practicing a faith more closely aligned with Islam. With the Cham gone My Son languished in obscurity until the late 1800’s, when a group of French archaeologists took an interest in the area and began to explore and document it. Some of the antiquities of My Son now reside in French museums. 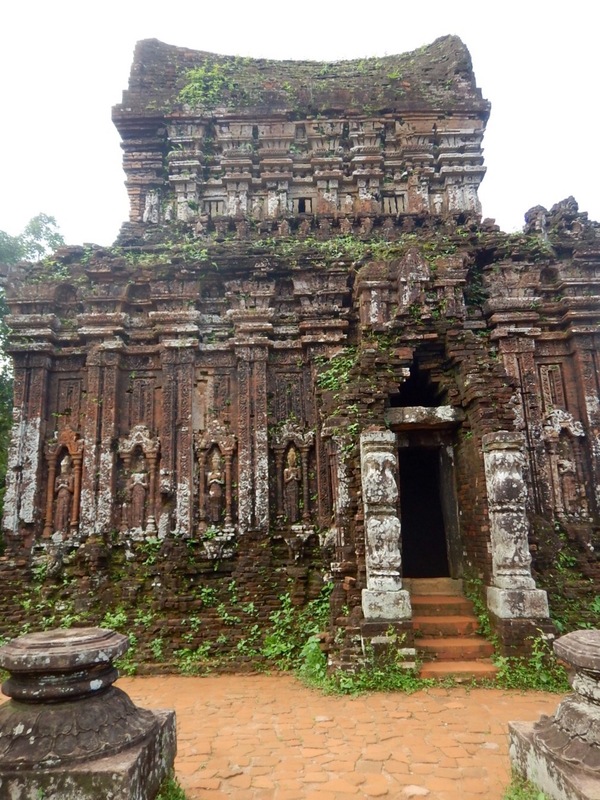 The Cham were known as fierce warriors but they were clearly also remarkable engineers and builders. 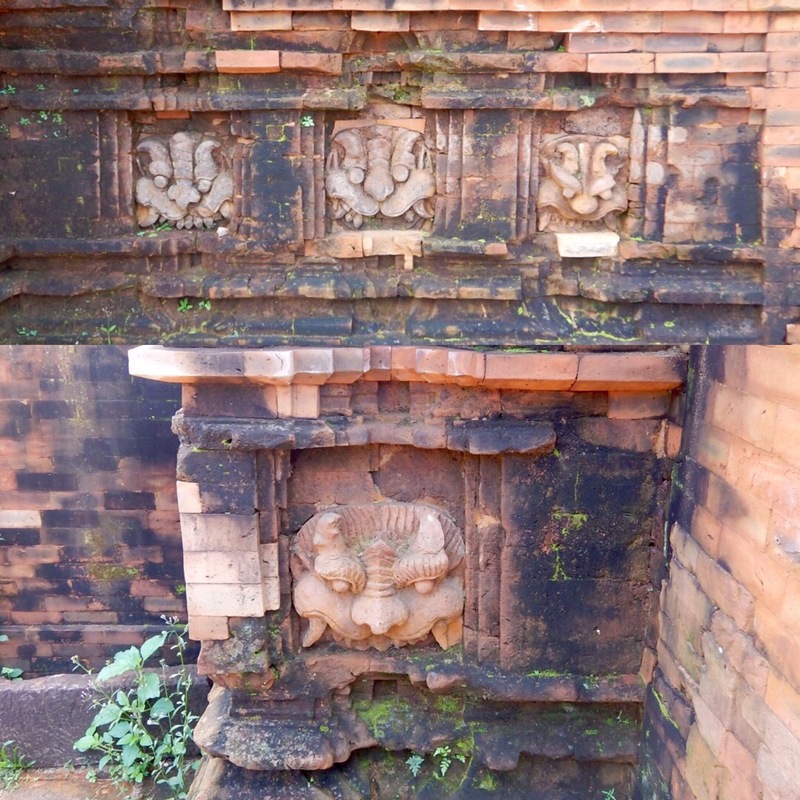 My Son Sanctuary consists of at least 71 structures discovered to date, with exploration ongoing. The Hindu influence of the time is evident in the intricate carvings that decorate the monuments, all dedicated to the Hindu god Shiva. 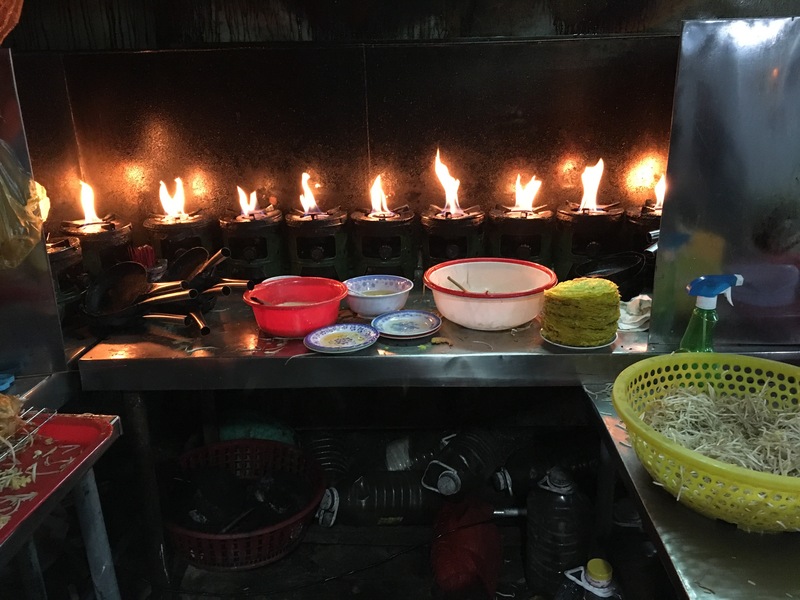 As the heat and humidity of the jungle rises – even at this early hour – I’m grateful for the advice of my travel guide to get an early start. The area is remarkably accessible, and I am free to wander in and out of the crumbling structures. The site will be soon be crowded as big loads of sightseers are disgorged from their buses but in the quiet light of early morning I’m completely grateful to be able to take my photographs unimpeded. I’m one of a very few enjoying the peace and sanctity of the sanctuary at this hour. Bliss. 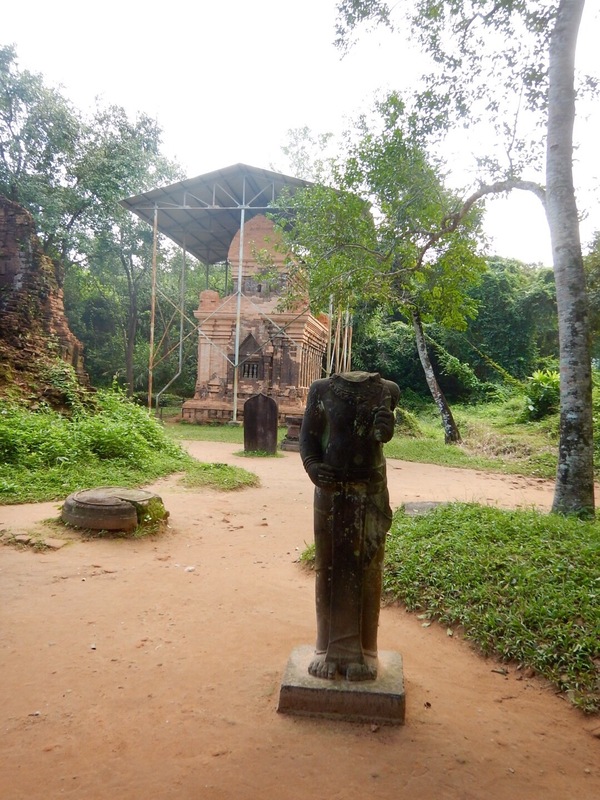 My Son Sanctuary is the longest inhabited archeological site and the most important Hindu temple area in Southeast Asia. 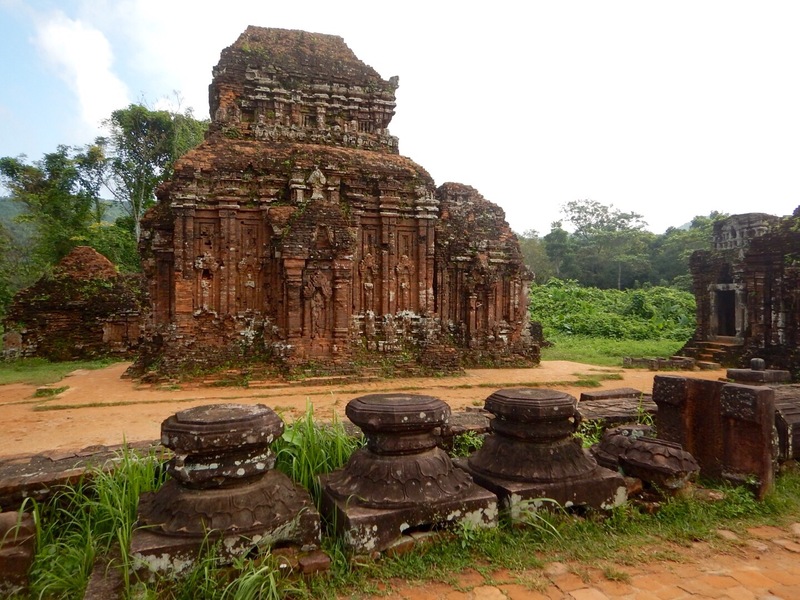 So it’s all the more egregious that this ancient and holy site was carpet-bombed during the Viet Nam war. 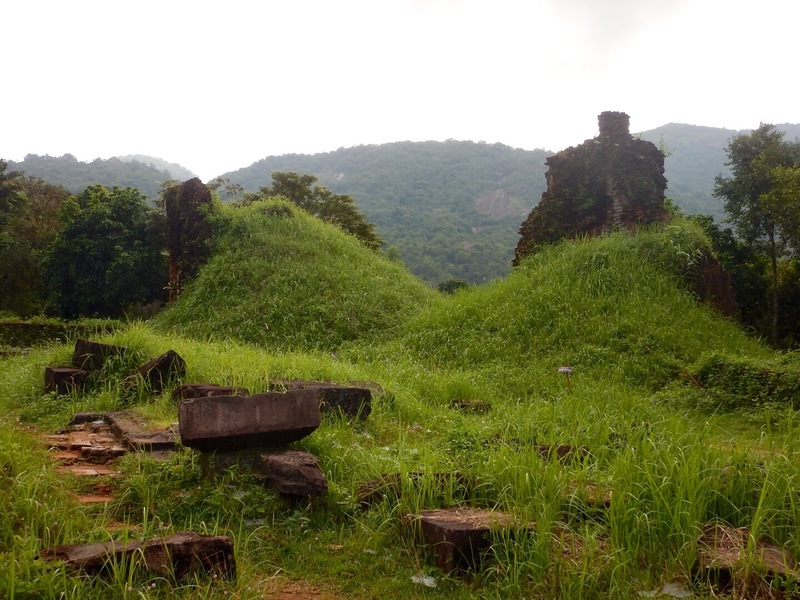 Many precious monuments were reduced to piles of rubble, now gradually being reclaimed by the surrounding jungle. 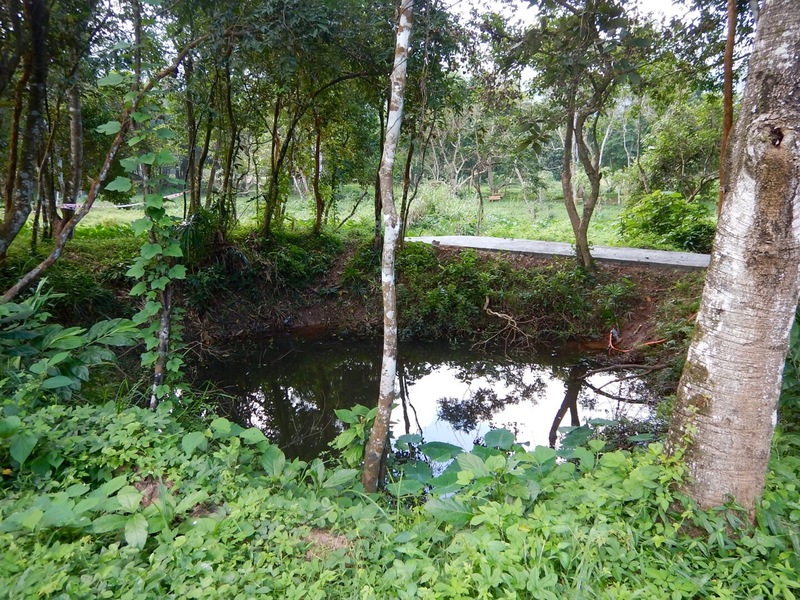 The charming little ponds that dot the area, and the mounds and dips in the lush terrain are actually bomb craters. I want to cry. Bullet damage to ancient texts. Significant reconstruction is taking place at My Son and many experts are working to preserve what’s left of this spectacular place. There are well-founded concerns about collapse of the remaining monuments, and heavy storm run off from the surrounding mountains makes preservation all the more challenging. 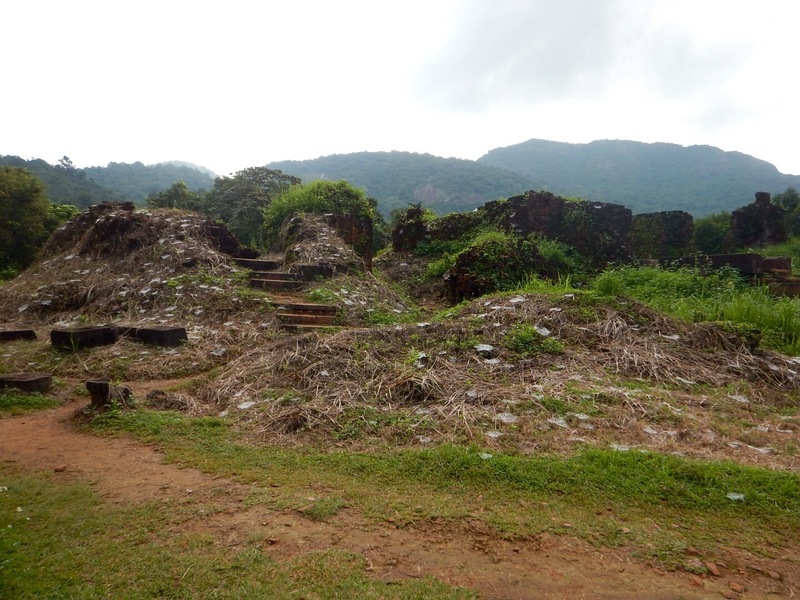 Designation of My Son as a UNESCO World Heritage Site in 1999 is helping to fund the project. 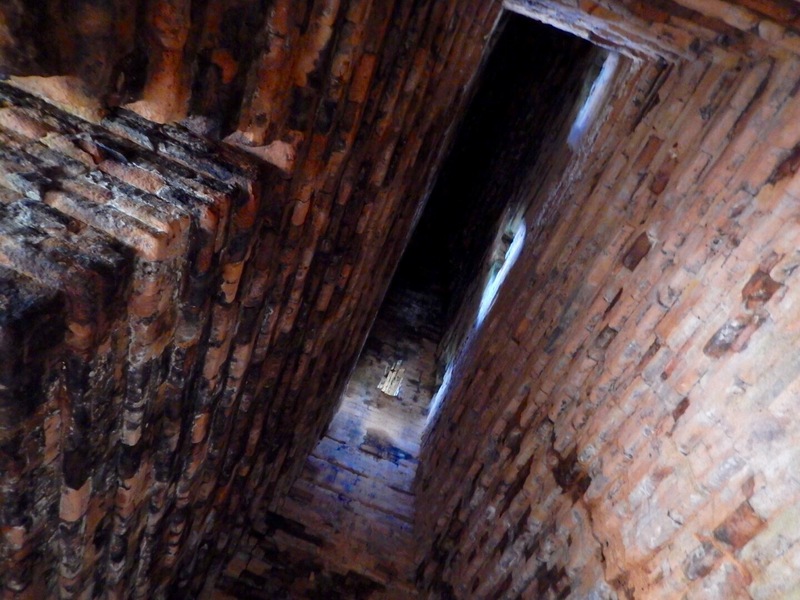 I screw up my courage to explore the dank interior of one of the large monuments and am rewarded with this illustration of remarkable building skills. The trip back from My Son is an adventure in itself. 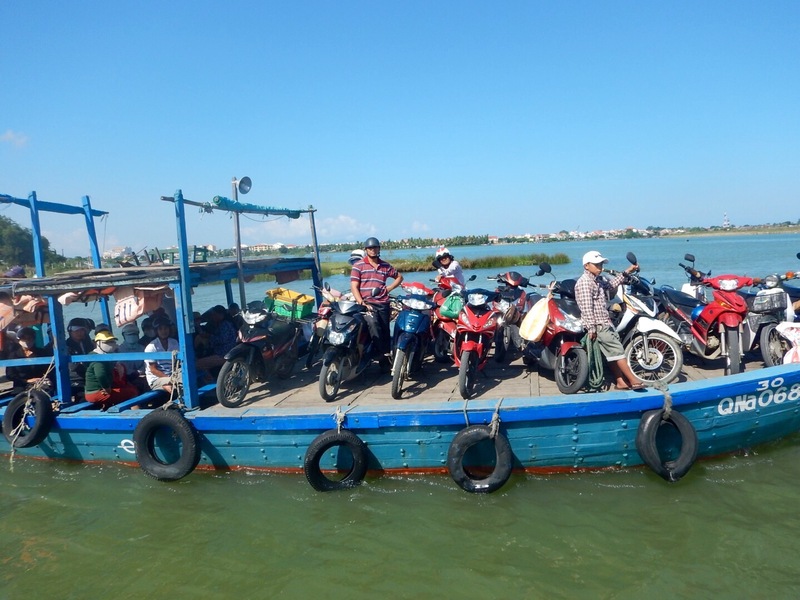 This is our transport across the Thu Bon to Hoi An. Does it look a little tippy to you? No worries though. The tiny woman at the helm has everything under control. 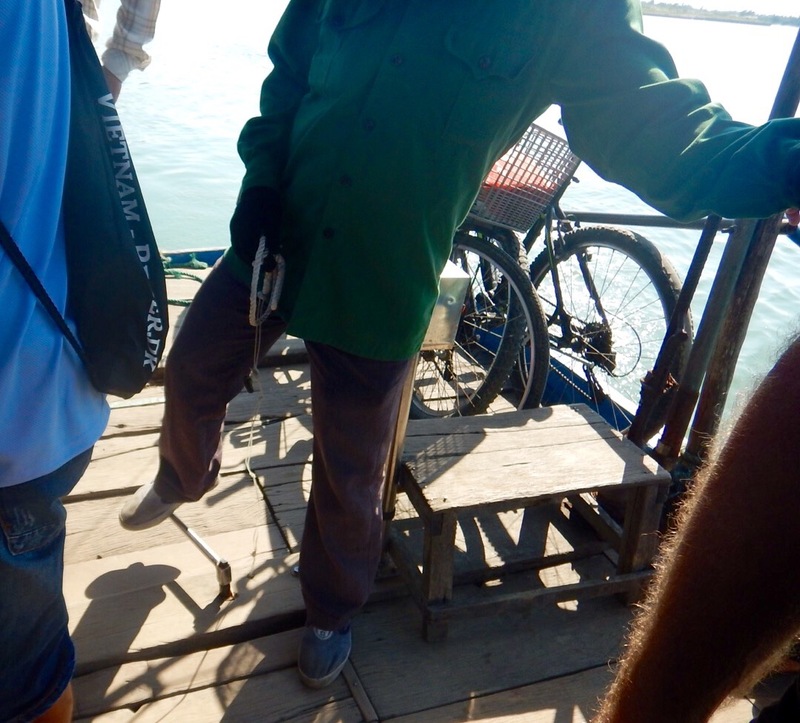 She’s steering the boat with her foot on the metal bar that moves the rudder, and the speed is adjusted by pulling the string threaded up from the motor through the tiny hole in the deck. As rudimentary as it seems, she can parallel park this boat on a dime. Sadly, she may be out of work in a few months with completion of a new bridge across the Thu Bon. I guess that’s progress. 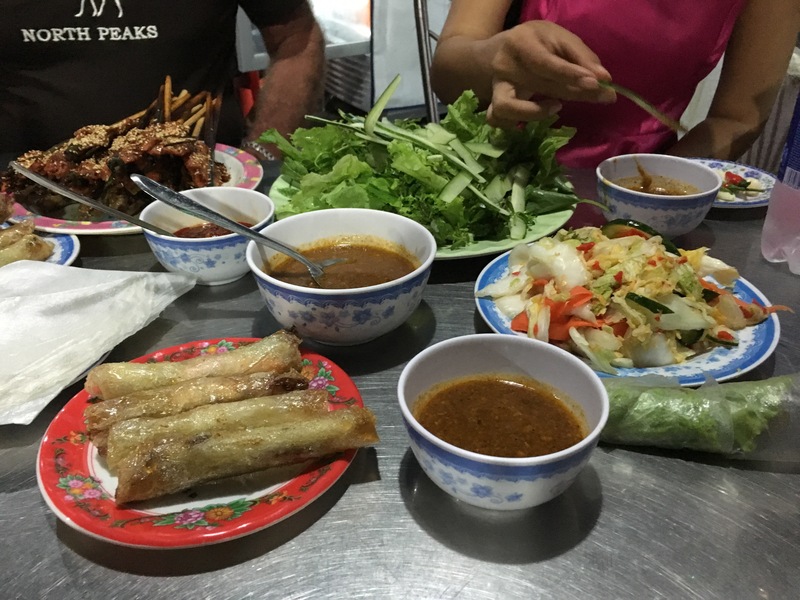 Dinner on my last night in Hoi An is the best yet. 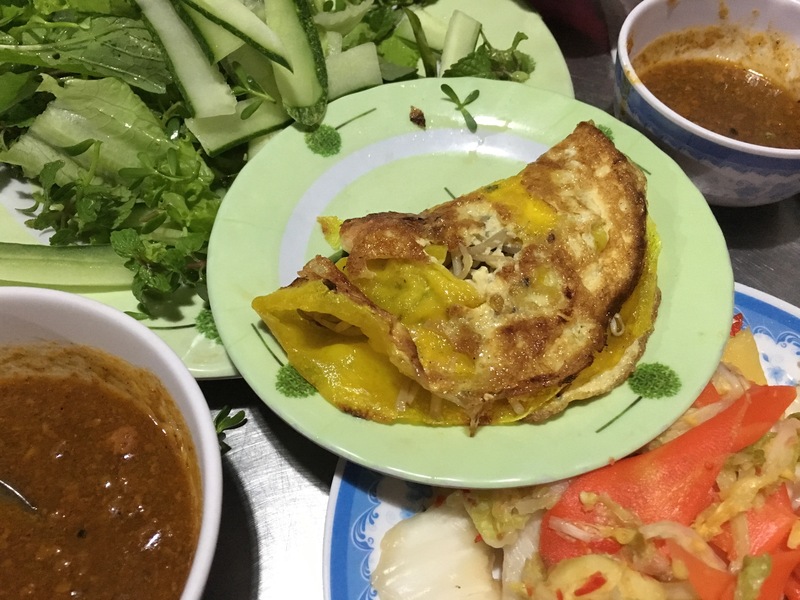 Delicious, traditional Hoi An pancakes are stuffed with fish and noodles then cooked until crispy over individual burners – served with crunchy spring rolls and mounds of fresh greens. I could eat this food forever!